Although the Battle of Naseby (14 June 1645) is generally regarded as the decisive action of the First Civil War, dooming the Royalist cause to inevitable defeat, fierce fighting continued for over a year, including several pitched battles and numerous sieges. By the end of 1645, with his forces crumbling and his territory shrinking, King Charles' hopes were increasingly dependent on the Royalist heartland of the Welsh Marches and the tiny field army which Jacob Lord Astley was struggling to muster there. 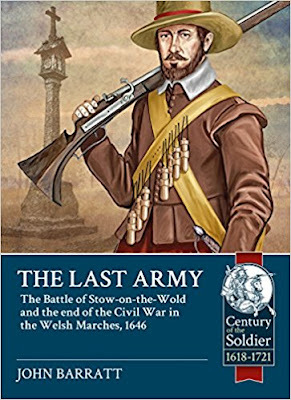 This book describes the often dramatic preliminaries to this and sets in context Astley's campaign which ended on 21 March 1646 with his defeat at Stow-on-the-Wold – the last pitched battle of the First Civil War, together with the last stand of the royalist garrisons in the Marches. This book, making comprehensive use of both Royalist and Parliamentarian sources, will be the first complete detailed study of these events which finally doomed Royalist hopes in the First Civil War. It will be of interest to military and local historians, the general reader, re-enactors, wargamers and modellers.